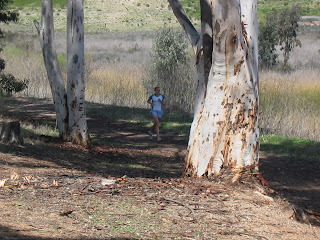 I recently had a fellow coach in Australia ask me a question, that after I answered, I figured may be of value to a wider audience: "I have been reading your books and planning my ultra marathoner's preparation for a 100 mile event. In your experience what are the key areas (mechanically, physically or mentally) that the ultra marathoner should be working on, or the key areas that make the difference between a good day and a great day?" · Here’s where it ALL happens – very, very few individuals can actually train sufficiently for a 100 mile foot race – there are simply not enough hours in the day of the average person who has a full time job! So in these races it comes down to a management of self, a controlling of emotion. It’s very hard to go out conservatively enough for the younger racer & they shoot themselves in the foot in the 1st 30 miles. There is also no such thing as a “perfect” day out there – every race will have tough patches & the neophyte expecting everything to go according to plan is in for a rude awakening. The mantra becomes, “You will have bad patches & they will pass”. Training an ultra runner to deal with the mental emotional demands of competition is essential – visualization, manipulating & habituating internal dialogue & massive preparation that ensures an answer to every eventuality, even the ones that are not predictable is essential. Feeling ready, excited & confident is what is required in order for the athlete to reach beyond their logical capabilities on race day. It’s ALL about attitude. These races almost always take the athlete to a place of altered consciousness beyond logic & a fair amount of trust in their coach, training & self is crucial to a good performance on the day. It becomes necessary to define for themselves, very, very clearly what a successful race would be. So often a runner is disappointed by a result that to the coach & other observers seems to be in alignment with what was being said & shown in training only to be hijacked by an unsaid, un-divulged (even to self) expectation once the run is complete. · A 4th point that you do not mention, but that is as important as the preceding 3 is the question of logistics & planning. These races are all about prepping like for military exercise – it’s hand to hand combat with yourself out there & it requires planning down to the most minute detail. I have athletes set up a large piece of poster board & as the weeks go by, they record every detail of what needs to be done, by whom, by when & how: Foods, liquids, quantities, pace, expected arrival times at aid stations, shoes, gear (warm, cold, lubrication), weather, terrain, flashlights, aid station procedures, options (especially with foods), which pacers where, what kind of motivational tools, statements may be required by these pacers, body weight, variability expected, temperatures, quirks, superstitions, tone of voice, etc, etc, etc. Accommodation, drivers, pre & post race, travel, support team & leader – all on a time line that covers the slowest possible scenario, an okay scenario, an ideal scenario, & dream scenario. What are the deal breakers – when can you pull the athlete out. Aid station procedure based on athlete status (physical, mental, emotional). Tips, cues, cue cards, idiosyncrasies etc. It never goes according to plan, but it does not go at all without a plan!